Put Denver’s own liqueur for lovers in the service of cupid with these recipes recommended by Tingala. This liqueur’s lip tingling buzz makes lips feel more voluptuous–and kissable. Combine simple syrup and pineapple juice in a prepared flute glass. Slowly pour in the sparking red wine. Gently drizzle Tingala over the back of a bar spoon held just above the drink. Garnish with a strawberry. Serve. Glassware: Nick & Nora glass. Combine ingredients with ice. Stir, and strain into a cocktail glass containing a single large ice cube. 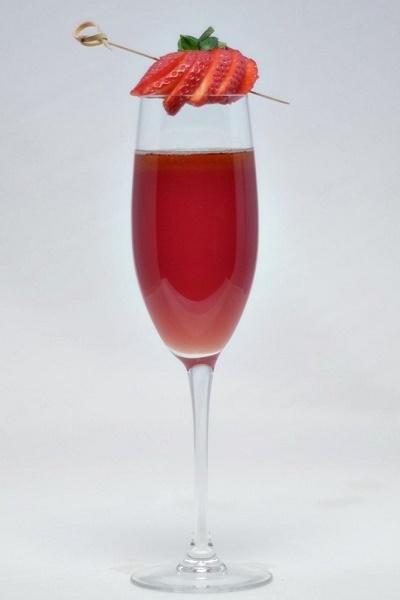 Garnish with brandied cherry. Serve. This drink is not shaken, not stirred, but built. Create this stacked shot by first pouring Irish cream in a cordial glass. Next, slowly drizzle dark chocolate liqueur over a bar spoon held close to the surface of the drink. Pouring slowly again over the bar spoon, top with Tingala. Creates layers for an eye-catching presentation. Optional: To flame this cocktail – Starting with a warm glass, make this drink. Pour a bit of Tingala into a spoon and ignite with a match. Using extreme caution not to top over the glass, pour onto the top of the drink. Serve immediately. Extinguish flame before drinking.